Welcome to Part 3 of Cryptyk’s Threat Analysis Series where we evaluate each of the 5 major threats to the cloud for enterprises. In this article we will analyze internal threats, and how Cryptyk’s hybrid blockchain technology acts to counter the diverse vulnerabilities they present. This article describes how Cryptyk's Vault and Sentry platforms work together to prevent damage from malware and viruses. Malicious software known as malware has been a fact of life in the internet world since its creation. 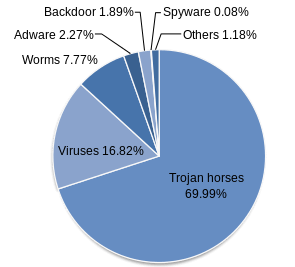 Malware includes viruses, trojan horses, adware, bots, bugs, spyware and worms. Most people know that they need an antivirus scanning program installed on their computer. However, if anti-virus software is not regularly updated viral infection is inevitable. Moreover, when a new virus appears there always exists a period of time until it can be identified and the appropriate anti-virus update developed. Some polymorphic viruses can even take several days to catch once they are known because they re-write their identifying code or signature and produce a slightly different clone of themselves. Consequently, anti-virus scanning strategies can never be 100% effective, and are reactive rather than proactive in nature. The security of an enterprise organization is only as strong as its weakest link (or least careful employee). If a virus makes it to a shared folder within an enterprise cloud network, it can execute and spread to infect files and user PC’s companywide. If a virus creates a backdoor into one user, the entire organization’s files are at risk of being copied, stolen or corrupted, leading to catastrophic internal losses. In the worst-case scenario one well designed piece of malware can bring down the entire enterprise network and halt all business operations. Rather than trying to quickly react to every new viral threat as it emerges, Cryptyk has developed a storage architecture that is inherently immune to all malware. If a malicious program is successfully uploaded to a user account on Cryptyk’s Vault storage platform, it is split into 5 different non-functional pieces that are stored on 5 separate cloud providers. There is no way that a malware file piece can locate all of its other separately encrypted and stored pieces, and hence no way that it can decrypt these pieces, assemble itself, execute and propagate. For all intensive purposes the malware file has been deactivated. Even though Vault is passively immune to malware uploaded to a cloud storage account, Cryptyk’s Sentry security engine also includes traditional anti-virus scanning as part of its “Proof-of-Security” protocol. The main reason for using traditional anti-virus techniques in addition to Vaults passive immunity is simple…. to save storage space. Without anti-virus scanning a user’s storage account could quickly fill up with gigabytes of useless non-functioning malware that takes up valuable space. An additional reason for anti-virus scanning is to minimize the risk of downloading malware from a cloud storage account onto a users’ local device. Of course, there is a chance that a virus could get past anti-virus scanning when uploaded to the cloud, and then get past scanning a second time when downloaded to a local computer device. However, because the virus cannot execute while stored on the Vault platform, there is no chance that a virus could propagate from a shared folder throughout an enterprise cloud network. Any malware damage would be on a single local device per single download case. The enterprise cloud storage network therefore becomes the safest place for employees to store their files. Cryptyk has successfully tested Vault storage against all types off malware threats during the test phase of our prototype platform by a team of international hackers. One invited hacker did in fact get past anti-virus scanning and successfully uploaded a virus to his own account. However, he spent several frustrating weeks trying to get the virus program to execute without any success. This is a classic example of how Cryptyk's hybrid blockchain technology takes the profit out of hacking.